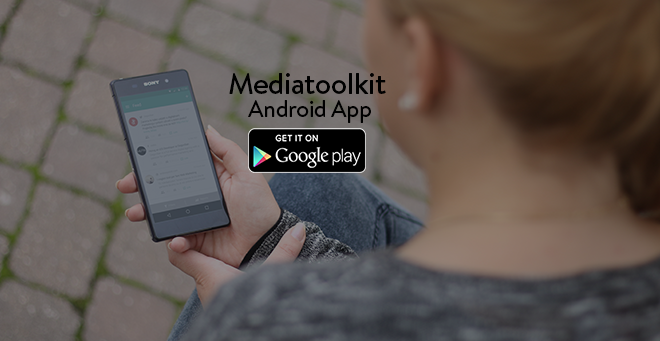 We’ve been working really hard to make Mediatoolkit an even better experience for you. We are proud to say that we have now released a major upgrade! 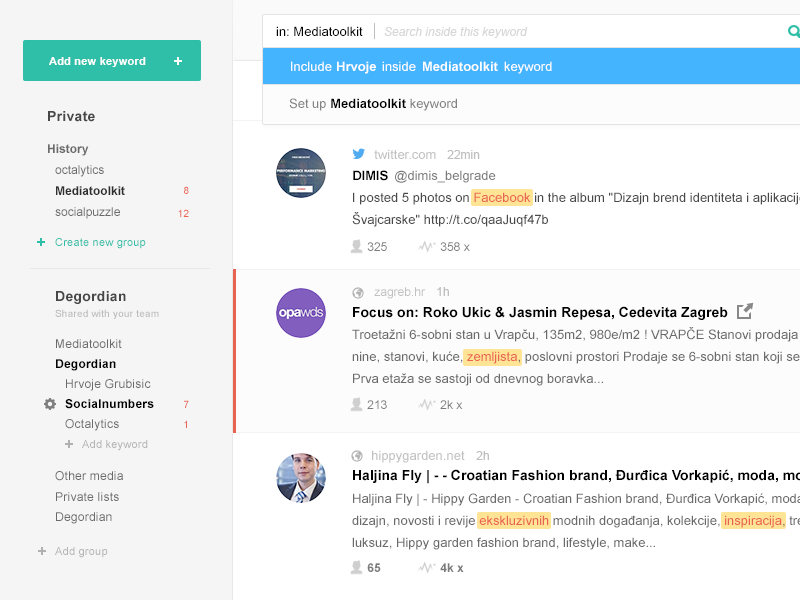 Mediatoolkit is now easier to use than ever and features major improvements in keyword setup, advanced reports and analytics and shared groups that allow you to share your keyword groups with teammates and colleagues. Media monitoring tools are primarily aimed at marketing and PR agencies, however we believe that absolutely everyone from your company can profit from relevant information media monitoring provides. With this update we wanted to make Mediatoolkit even more approachable, so we simplified keyword setup and user interface is now B2B cool, intuitive and easy to use. Add new keywords by clicking on the search bar in the left corner of your screen, type in your desired keyword (or search query) and then press Enter. Your feed is now full of mentions of your keyword. You can easily edit your keyword by clicking on Edit filters where you can set up advanced options and Boolean search operators for more advanced keyword queries. To save your keyword for monitoring just drag and drop it to any of your groups, or create a new group and save it there. Learn more about new keyword setup. Advanced options include AND, OR and NOT operations. By using AND operation you can add all the keywords that you want to be included in an article mentioning your main keyword. Remember, all of the words with AND operator must be included in this article. Another option is OR operator which enables you to add all the keywords that might appear in the article mentioning your main keyword – one of these words must be contained in the article! Lastly, you can easily filter your feed by excluding keywords you don’t want to appear near your main keyword using NOT operation. We worked hard on this particular feature as a result of our users feedback. New reports include different subcategories with detailed analytics and graphs on number of mentions, sources, influencers, sentiment, tags and topics. Now you can compare performance of various keywords regarding all of previously mentioned subcategories so you can make even more detailed reports and discover insights behind your mentions in more depth. You can also export all of the reports and easily create amazing reports for your subordinates and clients. Explore reports now! We believe that absolutely every employee from your company can profit from relevant information that media monitoring provides. Sales representatives can track potential clients and discover leads, brand and marketing managers can discover new campaign possibilities and track competitors, PR professionals can compare your company’s media coverage to competitors and discover new influencers writing about your industry, HR departments can observe public image of your company as an employer etc. That’s why we decided to introduce company accounts and private/public groups. Start inviting your colleagues and select their role: Admin, Viewer or Editor! Learn how to manage your account easily. Public groups are most useful for big teams that are working on same project and need to monitor same or similar keywords. 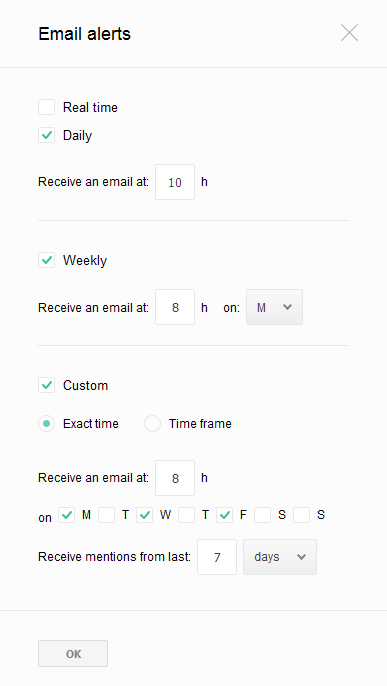 You should use groups to separate your private interests from general keywords you track as a company. You can share groups with your colleagues or teammates, and keep your personal interests private. It is important to have this kind of group so all members of certain team can easily monitor all the keywords relevant for them. That’s it for now! We’ll explain all new features in detail in next few days, so follow us for more information. Also, let us know if you’ll need any help. We strongly believe you’ll be able to get even more information valuable to your business from Mediatoolkit! Get notified immediately when you are mentioned anywhere online! Create detailed reports, measure your online media activities and discover meaningful insights behind every mention.